Saturday saw Christian and I take another trip to the Manitoba banana belt, a rather a-peeling place to be. 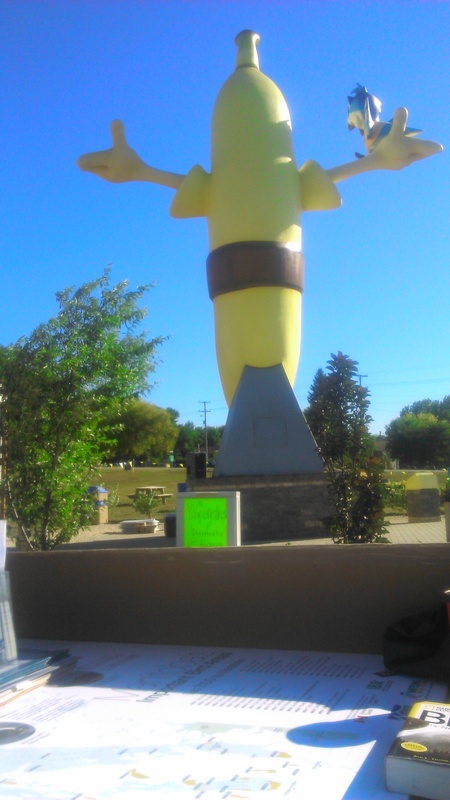 Apart from the world’s largest banana statue right in the heart of Melita, there are not really many bananas to be seen but the climate is relatively warmer in summer than the rest of Manitoba, hence the name ‘banana belt’. Now Melita has a very joyful looking Banana in the centre of the town called Sunny. Sunny is joined by his friend Breezy the Blue Jay. And what does it say on Breezy’s t-shirt? IBA! 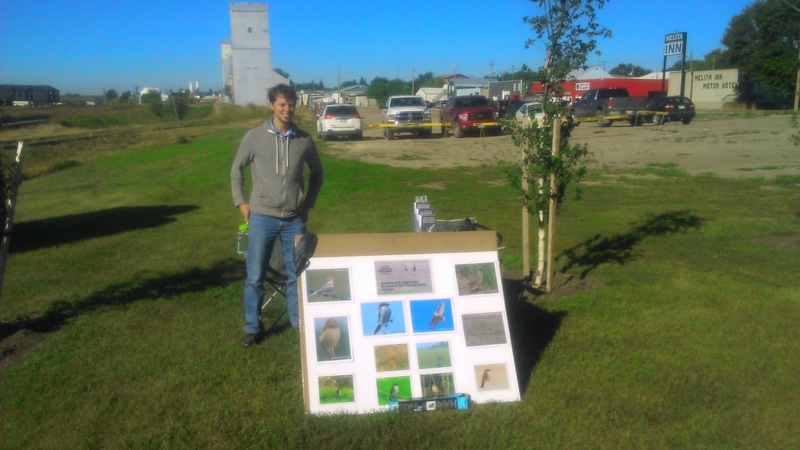 Because this is an Important Bird Area and the town itself cherry-ishes this not just with the statue but also with banners on Main Street proclaiming it as the ‘Grassland Bird Capital’ of Manitoba. This is of a course a peach of an area when it comes to birds and, well we could not manage a trip to the southwest without seeing a few birds on the way. 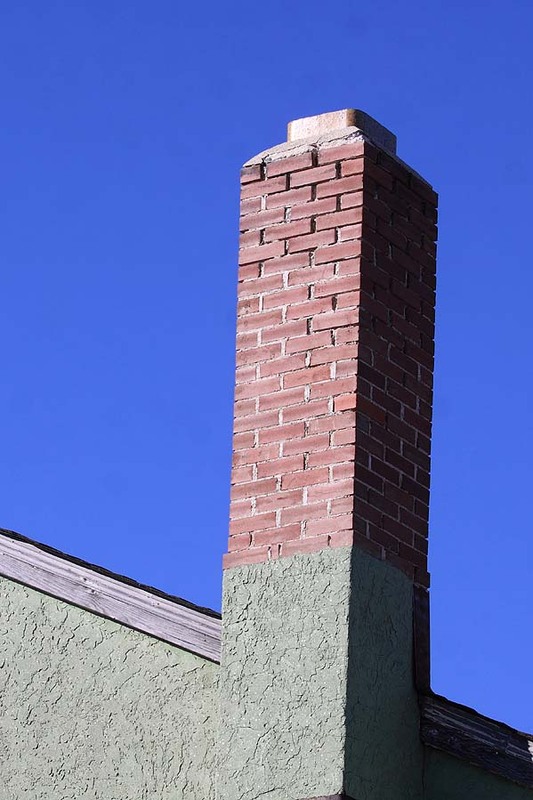 The most important record for the day came from Christian who managed to confirm the first ever successful breeding of a pear of Chimney Swifts in Melita (an entry/exit cycle was observed in the Legion Memorial Hall chimney and young were heard calling). A second plum bird sighting from the Banana Days was of a Swainson’s Hawk swooping at a Golden Eagle, some sighting at this time of year! The journey down also did not disappoint, with a sub-lime combination of birds from the Pectoral and Baird’s Sandpipers, Grasshopper Sparrow, berry large flocks of blackbirds and good number of Mourning Doves. Anyhow, I digress and it should be made clear that birdwatching was not our priority on this occasion. We had a grape morning speaking with a number of people, both young and old from from Melita out to Boissevain (and probably further than that). People came for the family fun (bouncers, games, crafts) and probably in a fair few cases, the free banana split! The guys over at the Manitoba Burrowing Owl Recovery Program were great company on the adjacent table especially Koko the Burrowing Owl, a star attraction if ever there were one (http://www.mborp.ca/). Our aim was to promote the Grassland Bird Initiative and the IBA Program in this area. As we blogged earlier this summer (see here; here; here), this area is important for its areas of native mixed-grass prairie and associated bird species. We believe that landowners and local communities are vital to conserving both this habitat and the special birds. Our presence on a Saturday morning is a reflection of this view and we hope in the future to increase our efforts in this regard. Apple-y, it would seem that many people agree with this view by the stream of visitors to our table. On a separate note, Marshall Birch our summer Green Team Program Assistant has now left the program after his funding ended. We would like to thank Marshall for his enthusiasm, great blog writing and terrific work ethic over the past few months and wish him also all the best with his future plans. Next we made a trip to Whitewater Lake but that is a story for another blog.